There is an episode of Friends called “The One Where Phoebe Runs.” Rachel and Phoebe go for a run together, but Rachel gets embarrassed because Phoebe runs like a little kid with her arms flailing. I love what Phoebe says to Rachel when they argue about it. 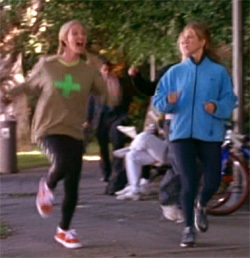 Rachel is reluctant to try it, but on a run alone one day, she tries running Phoebe’s way. She runs into Phoebe while running and they scream at each other. I love this episode and whenever I’m feeling bummed out about exercising, I think of it. 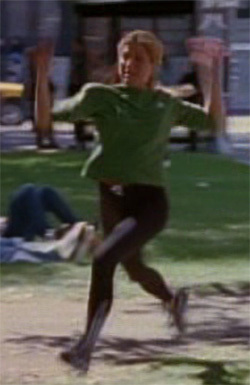 If I’m huffing and puffing along, sometimes I try running like Phoebe for a second or two. I let my arm fly out and just run as fast as I can like I did when I was a kid. It makes me feel so much better! Update 02-21-08: I found the video! I never seen the episode but sounds like fun.